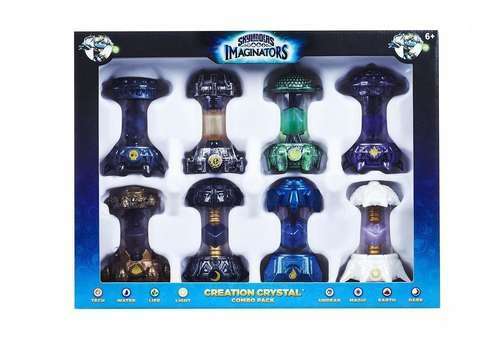 Skylanders Imaginators Creation Crystal are special figures that allow players to create and transport their own imaginators. Each crystal can be used to create one brand-new Skylander, with an unlimitless combination of power, appearance and catchphrase. Once you've made your Skylander, you can use its creation crystal to transport it to any console, anywhere. The following platforms will support Skylanders Crystals: Xbox one, Xbox 360, Playstation 4, PlayStation 3, Nintendo Switch and Nintendo Wii U. It’s also compatible with imaginator games only. With the Skylanders Imaginators Creation Crystal combo pack you can fight Kaos and his Doomlanders and become a true Portal Master.